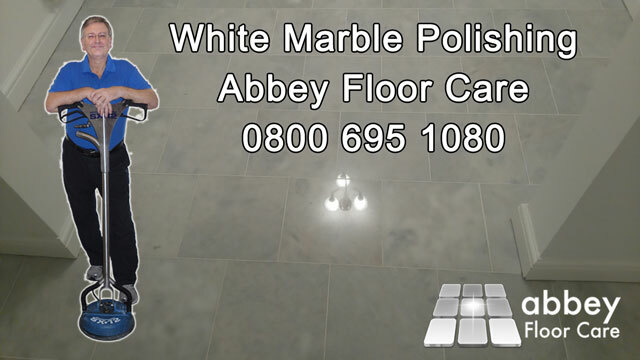 Hello this is Abbey Floor Care and we are in Stoke-on-Trent Staffordshire, restoring a marble tile floor. In the walk areas, the finish was dull and scuffed. The tiles were quite uneven, and the difference in some areas was over 3mm, which is quite excessive. The grout was quite a lot lower than the surface and difficult to clean. So over the years it had become stained and discoloured. We started by installing protective sheeting to the walls and adjoining rooms to protect them from splashes from the work area. The first job was to get rid of the lippage on the floor by diamond grinding. We used 30 grit sintered metal diamond tooling on our planetary machine. We added weights to the machine to speed up the grinding. The grinding machine weighed in at 125kg, a heavy piece of kit. If the tiles had been relatively even, we can feather the grinding up to 25 to 50mm from the wall, reducing the cost of the restoration. However the tiles were so uneven that we had to grind right to the edge of the floor, otherwise there would have been 3 to 4mm tile edges sticking above the floor. The grinding machine grinds close to the wall, but not right up to the edge of the wall, it grinds to 3 to 4 mm from the wall. So we ground the edges of the floor using a combination of hand grinding and machine grinding. Once the whole floor finished we progressively honed the floor through 50, 100, 200, 400, 800, 1500 and 3000 grit stages. Then we used marble powder polish to create a beautiful shine. Grinding the floor had reduced the height of the tiles to the level of the grout, creating a monpolithic or single surface. This will make cleaning and maintenance a breeze, as there are no deep grout lined to capture dirt. We finished off treating the floor with impregnating sealer to further protect the floor and the grout from staining and to aid cleaning. The floor now looks beautiful and shiny, better even than the day it was installed. We carefully explained the importance of looking after the floor properly. It is important to use the correct stone floor cleaning chemicals, as standard floor cleaners will strip away the sealer, leaving the tiles porous and difficult to keep clean. Using the correct cleaners will enhance and extend the life of the finish, leaving the floor beautiful for years to come. If you would like your marble floor or any other kind of stone floor restoring to a beautiful finish call Abbey on 0800 695 0180 or complete the simple contact form.